MOSCOW, January 30. /TASS/. Russia and Algeria have discussed the possibility of starting production of the Russian Lada car in that African country, Energy Minister and co-chairman of the intergovernmental commission with Algeria, Alexander Novak, told reporters. "We also discussed the possibility of setting local production of the Russian Lada car," he said. Novak noted that the parties also discussed the possibility of building a plant for the production of building materials in Algeria, increasing the supply of pipe metallurgical products and grain, as well as deliveries of Russian medicines, implementing joint projects on cybersecurity. Currently, Russian largest car maker Avtovaz exports bodies for Renault Logan cars to an assembly plant in Algeria. The plant is a joint venture of the Algerian government and the Renault group, which owns 49% of shares. The enterprise assembles Renault Logan under the Symbol brand. The project was launched in December 2016. 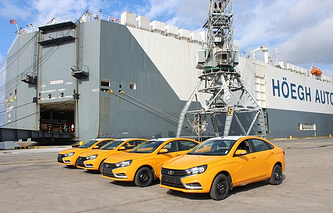 Deliveries of welded and painted bodies from Russia contribute to the development of the production site in the promising market of Algeria.